Keep The Tip Credit. Phase the Raise! There are several bills that include changes to the tipped employee wage and the tip credit system. Striking or eliminating the tip credit system over time will result in a dramatic rise in hourly wage in our state. With a few exceptions, current minimum hourly wage for tipped employees is $2.13. With a slim 6-10% average profit margin, these increases will force many restaurants in all areas to close their doors. Those that do not will take various drastic measures to adapt. These methods include sharply increasing menu prices, reducing staff, a switch to counter service and/or an option to add a service charge to the bottom of each check. All of these options threaten our livelihood. A sudden increase in menu pricing will reduce guest incentive to tip well, as will poor service resulting from a reduced floor staff. A switch to counter service will turn servers into cashiers, food runners and bussers, truly taking the "service" out of the service industry. A service charge at the bottom of the check looks like a tip to the consumer, but under current law is a very different thing. A "tip" is freely given and is federally protected property of the employee. An automatic service charge is whatever amount the owners decide it should be and is their property as long as the minimum wage is met. We are all already currently guaranteed to make minimum wage and in reality make much more than that. By eliminating the Tip Credit, an employer is no longer required to allow us to make up the difference another way, i.e. tips. According to the NM Workforce Solutions State of the Workforce Report 2018, Leisure and Hospitality is the 2nd fastest growing industry (2.3% growth rate) in New Mexico. Accommodation and Food Services are the third largest percentile of New Mexico's work force (11.3%), a great number of whom rely on tips for income. According to The New Mexico Tourism Department, the New Mexico True Campaign is helping to bring record numbers of tourists to our state and exceeding anticipated numbers by 50%. Santa Fe, New Mexico is consistently one of the top tourist destinations world wide. New Mexico cannot afford to make a costly mistake in this profitable and growing industry by forcing a giant leap in tipped employee income. We are restaurant workers, not owners. This petition is created of our own volition. 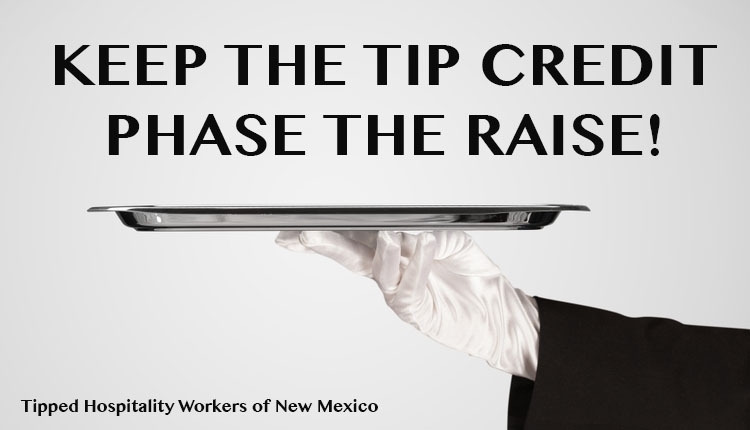 Therefore, we, the Tipped Hospitality Workers of New Mexico, ask Governor Michelle Lujan Grisham and the New Mexico Legislature to not eliminate the tip credit contained within any bill addressing an increase to non-tipped minimum wage. The current $5.37 tip credit allowance, if kept tied to the state minimum wage, will already increase tipped employee's hourly wage along with the increases in non tipped minimum wage. The places we work will have a better chance of survival and we can retain control of our income by use of the tip credit system. We are your constituents. We are your neighbors. You see us at the grocery store, at the park, at the gym. You certainly see us at your local bars and restaurants. Listen to our voices. Please keep the Tip Credit and Phase the Raise. The Keep The Tip Credit. Phase the Raise! petition to New Mexico Governor Michelle Lujan Grisham and The State Senate was written by THWNM and is in the category Law Reform at GoPetition.